Rail, Taxi, Cars, City Bus available. Canberra is the capital city of Australia and holds the seat of the country's government. The 8th largest city in the country, it is the location of many social and cultural institutions of national importance. An urban city that provides plenty of opportunities for outdoor recreation, Canberra is known for being a planned city. Walter Burley Griffin, an American architect, won the international design award in the 1920's - with a design of the city complete with an artificial lake and geometrically planned districts. 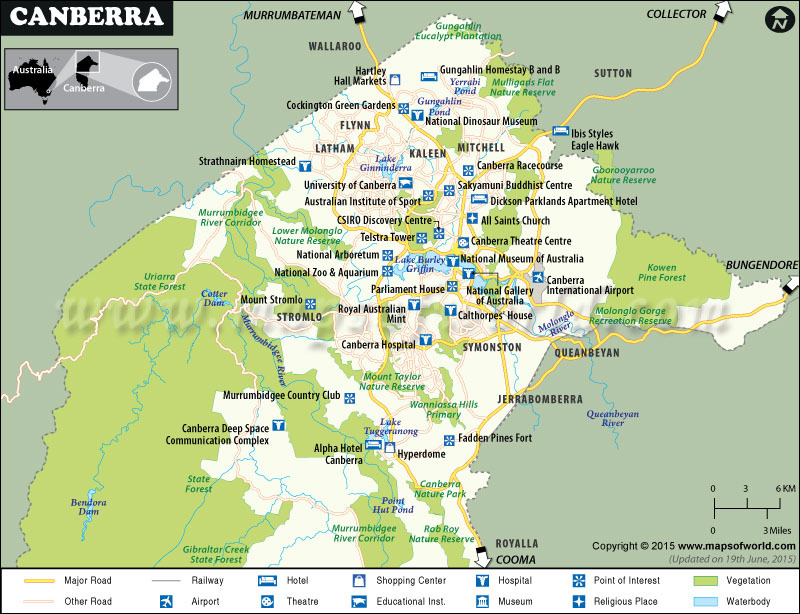 Canberra is located on the northern end of the Australia Capital Territory or the ACT. Its elevation is at 580 meters above sea level and is surrounded by the ranges of the Bindabella - with Mt. Majura having the highest point at 888m. By Plane - The Canberra International Airport is the primary airport that serves the city, with both domestic and international destinations available. There are hourly flights to Sydney and frequent trips to Melbourne. By Train - The NSW Countrylink provides schedules to Sydney and back, 3 times a day on Mondays, Wednesdays, Fridays, and Sundays; and 2 times a day during the rest of the week . The train may be slower than the car or bus but the scenic routes through the Southern Highlands and the Molongolo Gorge are worth the little inconvenience of time. By Bus - All ACTION buses meet and end at the Jolimont Centre, covering most areas of the city and that of other towns. By Bike - There is a developed network of cycle paths that provide safe and scenic roads for biking. There are also plenty of bike racks to lock your bike in shopping centers and other places of interest in the city. The most ideal time to visit Canberra is in Spring - when the weather is at its most pleasant. This is the time when flowers bloom and special events and festivals take place. The months of September to November are Spring time in Canberra, which are also the busiest in terms of tourist arrivals. Summers and winters in Canberra are equally harsh with scorching hot and dry temperatures in the summer and freezing cold in winter. Canberra Floriade - The city's flagship event, this festival of flowers is a yearly celebration taking place from September to October. Tulips are in full bloom, as well a whole range of other equally beautiful flowers. Art installations are presented, as well as garden stalls, pop up stores, makeshift restaurants, live music, and many other fun activities. The National Multicultural Festival - Canberra's international festival that shows the many cultures of the many nationalities in the city, the streets are filled with concerts, performances, and an international food fair occurs. Held every February of the year, it is a well-celebrated event that attracts locals and tourists to its over 200 stalls of different items for sale from many different nationalities that reside in the city. The National Folk Festival - For 5 days in Easter, Canberra puts up 20 stages for world-class artists to perform. Local, national, and international musicians come together for dancing, workshops, and exhibitions of the country’s proud folk traditions. Points of Interest (Places to visit) Lake Burley Griffin - Named after the architect who designed the city, this artificial lake is located in the geographical heart of Canberra. Its surrounding areas are filled with parks for picnics, areas for swimming, bike paths, and many opportunities for water sports and activities. On any given day in spring and summer, you'll find locals and tourists rowing, sailing, canoeing, kayaking, fishing, dragon boating, and a plethora of water activities. Australian War Memorial - A national memorial to commemorate the fallen soldiers of the Commonwealth of Australia wars, it contains a museum, a historic building, and the Anzac Parade - a road and thoughfare that is often used for ceremonial occasions and other military memorial events. Black Mountain Tower/Telstra Tower - One of the most visited tourist attractions of Canberra is the Telstra Tower - an iconic landmark that's located 195.2 m above the summit of Black Mountain. It provides a magnificent 360-degree view of the city, as well as the surrounding countryside. It has an indoor observation deck, an outdoor viewing platform. and a revolving restaurant. There are plenty of places to stay in the capital city of Canberra - with accommodation to fit any budget. Budget, midrange, and luxury hotels are abundant, as well as special accommodation such as pet-friendly hotels, heritage-listed hotels, and several camping options.